Mechanic's liens are used to encumber the title to an owner's property when a contractor, materials supplier, or other laborer such as a subcontractor has not been paid for labor, materials, or equipment provided. In Iowa, this is accomplished by filing a Claim of Lien with the district court. Iowa law entitles every person who furnishes material or labor for, or performs any labor upon, any building or land for improvement, alteration, or repair thereof, by virtue of any contract with the owner, contractor, or subcontractor to have a lien upon the building or improvement, and land belonging to the owner, to secure payment for the material or labor furnished or labor performed. I.C. 572.2(1). The entire land upon which any building or improvement is situated, including that portion not covered therewith, shall be subject to a mechanic's lien to the extent of the interest therein of the person for whose benefit such material was furnished or labor performed. I.C. 572.5. Perfect the lien by filing it with the clerk of the district court of the county in which the building, land, or improvement to be charged with the lien is situated. I.C. 572.8(1). NOTE: The lien must include a verified statement of an account of the demand due to the claimant, after allowing all credits. Id. The statement must set forth: 1) the date when such material was first furnished or labor first performed, and the date on which the last of the material was furnished or the last of the labor was performed; 2) the legal description of the property to be charged with the lien; and 3) the name and last known mailing address of the owner of the property. Id. Upon the filing of the lien, the clerk of court will mail a copy of the lien to the owner. I.C. 572.8(2). The statement of account must be filed by a principal contractor or subcontractor within two years, and ninety days after the date on which the last of the material was furnished or the last of the labor was performed. I.C. 572.9. This article is provided for informational purposes only and should not be considered legal advice or relied upon as a substitute for speaking with a legal professional. 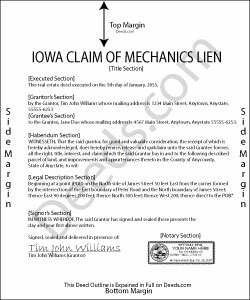 If you have any questions about filing a claim for a mechanic's lien, please speak with a qualified Iowa attorney. Robert B. said: Everything worked Fine. I wish there was an John Doe type of an example for the Tax form. Jamie F. said: I purchased he Alabama Correction Warranty Deed Form to correct a mistake in the legal description. However, this form says it must be signed by all who previously signed the deed. One of these people is now deceased. Can I use this form? How would it be different? I would give you 5 stars but wish this issue had been addressed. Thanks. Reply from Staff: Thank you for your feedback. From the product description: All parties who signed the prior deed must sign the correction deed in the presence of a notary. Brenda B. said: Excellent transaction. Reply from Staff: Thank you Brenda. Robert J D. said: I accidentally ordered 2 forms for the affidavit of death. I only need one. Reply from Staff: Thanks for your feedback. Looking at your account we do not see any duplicate orders. Our system does stop duplicate orders before they are processed in many cases. Have a great day. Lawrence D. said: My first time using it; very fast service. I am an estate planning attorney (44 years). None of my old title company contacts are around anymore to provide deed copies, so this is a great source. I will be using it again. Reply from Staff: Thank you Lawrence, we appreciate your feedback. Have a fantastic day!